They've taken over the phone company... Sure sounds like another one of Zak's tabloid fantasies. But while most people wouldn't believe him, he finds three who don't need convincing--Annie, Head of the Society of Ancient Wisdom, and her friends, Leslie and Melissa, two Yale coeds who traveled to mars in their modified van. The four of them must piece together fragments of an ancient puzzle, unmask the aliens, and destroy the stupidity machine. Here's where you come in... You direct the actions of Zak, Annie, Melissa, and Leslie, tacking them to many exotic places where they discover some pretty strange objects--and some even stranger characters! If this is your first computer adventure game, be prepared for an entertaining challenge. It may take a while to figure out some of the puzzles. If you get stuck, you might need to solve another puzzle first or use an object you haven't yet found. But if you hang in there and use your imagination you will guide Zak and company to victory! Getting started NOTE: It is recommended that you first make a backup copy of all disks and put the originals in a safe place. Commodore 64 or C-128: First turn off your computer and remove all cartridges. Then turn on the disk drive, the computer (C-128 users hold down the C= key), and the monitor. Plug your joystick into port 1 (Nearest the front). Put the boot Disk in the drive lable side up, then type LOAD "*",8,1 and press RETURN. If the game doesn't boot, turn off and disconnect all peripheral equipment (Such as printers, modems, and extra disk drives) and try again When Prompted, put in side 1 of the Game Disk and press the Joystick button. This came with the Atari version, and presumably other versions too. It includes a help list (color-encoded so that you won't "accidentally" see any hints you don't want), a list of objects (including where to find them and how to use them), a travel guide, maps, maze solutions and a complete game solution in narrative form. That solution is presumably the same one that appears in the book that accompanies the 'Classic Adventures' collection. But there didn't seem any point in copying it here since (a) it is copyright, and I am pushing my luck already, and (b) Game Cat's solution is already pretty thorough. 1) The Message Lines are the two lines at the very top of the screen. Words spoken by any of the characters, as well as hame-related messages , appear here. 2)The Animation Window is the largest part of the screen and is where the animated action takes place. It shows the "Camera's Eye View" of the room or location that the currently active character is in. 3)The sentence line is directly below the Animation window. You use this line to construct sentences that tell the characters what to do. A sentence consists of a verb(Action word) and one or two nouns(Objects). An example of a sentence you might construct on the sentence line is "Use Crayon on torn Wallpaper." Connecting words like "On" or "With" will be automatically inserted by the program. 4)Verbs must be selected from the words in the columns below the Sentence Line. All the verbs shown can be used. Check the list from time to time--New verbs will appear as the game progresses. To select a verb position the cursor over the word and click. 5)The Inventory is the area below the verbs. Each character you control has his or her own inventory. At the beginning of the game Zak starts with only one object. When a character picks up or is given an object during game play, the object's name is added to the character's inventory. There is no limit to the number of objects a character can carry. When there are more than four objects in an inventory, arrows appear in the middle of the list. Use them to scroll the list up or down. Nouns(Objects) can be selected in two way's. You may select a noun by placing the cyrsor over an object in the animation window and clicking. Most objects in the environment, and all usable objects in the game. have names. If an ogject has a name, it will appear on the Sentence line when you click on it. You may also select nouns by clicking on them in the inventory. To move the character around, select "Walk to" from the verbs by psisitoning your cursor over it and clicking. then move your cursor into the animation window, point it where you want the character to go, and click. If you point to an open door and click, the character will walk through it. Notice that "Walk to" appears automatically on the sentence line after a sentence has been executed--This is because moving around is what your character will be doing most often. To tell a character to carry out the directions you've put on the sentence line, either click once more on the final noun or verb selected, or click once on the sentence line itself. If nothing happens, double check the way you constructed the sentence. To replace a noun or verb on the sentence line without reconstructing the entire sentence, simply click on the replacement word. It will appear in the right place in the sentence. "Cut-scenes" are short, animated sequences--like scenes from a movie--which can provide clues and infomation about the charactes. When you are viewing a cut-scene, you do not direct the action so the text below the Animation window disappears. Open Zak's dresser drawer. Select "Open" from the verbs and then click on the dresser in Zak's bedroom, creating the sentence, "Open Dresser." Click again on the dresser to execute the sentence. Zak wil walk over to the dresser and open it. To pick up the plastic card under Zak's desk, try the sentence "Use Phone bill with plastic card." First, place your cursor over the "Use" verb and click once. "Use" now appears on the sentence line. Second, move the cursor over the phone bill in the drawer and click once, creating the sentence "Use Phone bill with." Third, select the plastic card by moving your cursor over the object in the animation window. By double-clicking on the plastic card you can complete the sentence and execute it at the same time. Notice that Zak was smart enough to pick up the phone bill first. Read Zak's phone bill by moving the cursor over "Phone bill" in the inventory list below the verbs and click once, creating the sentence. "Walk to phone bill." This time, instead of clicking on the noun a second time, click on the "Read" verb, changing the sentence to "read phone bill." Click once more on the "Read" verb and Zak will read the Bill, Notice that the final click can be on either the noun or the verb. Walk Zak to his living room by first openning his bedroom door ("Open door") and then walking through it ("Walk to door"). The screen will iris to black while the next room os loaded from disk. To switch control from one character to another, select the verb "Switch. "The names of the four characters you can control will appear as verbs.Place the cursor over the name of the character you want to control and click once.As a short-cut, you can use function keys or number keys to change characters (see below). NOTE: THE SWITCH VERB WILL NOT APPEAR UNTIL ZAK HAS SOLVED SEVERAL PUZZLES AND MEETS ANNIE. To find out what is in a room, select the "What is" verb and move the cursor aroud the room. When the name of something appears on the sentence line, you'll know that it is an "Active" object and you might want to use it in the game. If you click on that object, the "Walk to" verb will appear instead, You can then click on the object a second time to make your character walk to it, or you may click on any other Verb that you want to use with that ogject. To save your progressin a game, so that you can turn the computer off and start again in the same place, use the "Save" feature. "Save" will not work during cut-scenes.Users will need a blank, formatted disk to save each game.simply press the Save/load Game function key (See below) and follow the on screen instructions. To load a game you have saved, use the Save/load Game function key anytime after Zak has been loaded. Follow the on screen instructions. When the disk is being accessed or the game is paused, the cursor will change to a picture of a snail. We believe that you buy games to be entertained, not to be whacked over the head every time you make a mistake. So we don't bring the game to a screeching halt when you poke you nose into a place you haven't visited before. In fact, we maije it downright difficult to get a character "Killed." We think you'd prefer to solve the games mysteries by exploring and discovering. Not by dying a thousand deaths. We also think you like to spend your time involved in the story. Not typing in synonyms until you stumble upon the computer's word for a certian object. 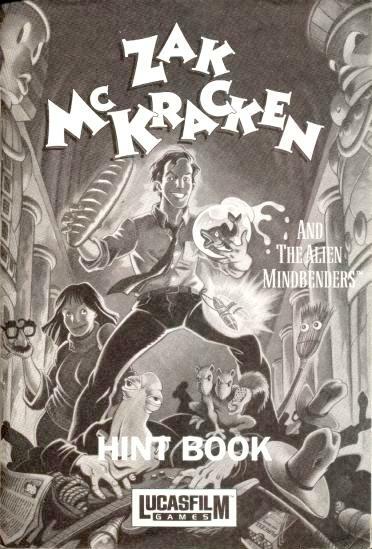 Unlike conventional computer adventures,Zal Mckracken and the Alien Mindbebders doesn't force you to save you progress every few minutes. Instead, you're free to concentrate on the puzzles, characters and outrageous good humor. - If your cash card becomes low..find a way to win the lottery!